If you dig a hole straight through the earth from Hawai'i, you'll end up somewhere in Southern Africa. So what's the most popular Hawaiian export like half the world away? Watch as surfers from near and far take the ultimate surf trips in the region! Directed by Kohl Christensen. USA / South Africa. 2015. 10 min. 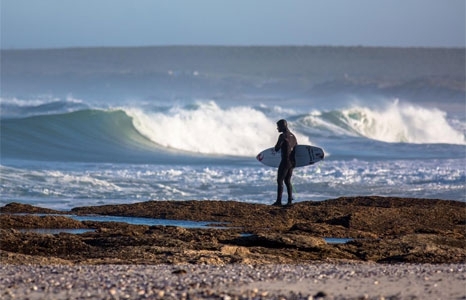 Kohl Christensen, Ben Wilkinson, and Josh Redman surf big waves in Cape Town, South Africa, before heading to a mystical right-hand point break in Namibia. Joined in Cape Town by a handful of big-wave chargers, the crew scores amazing conditions throughout the trip. Directed by Jason Hearn. South African. 2015. 26 min. After eight years of alcohol abuse, former world tour surfer Ricky Basnett returns to surfing, and embarks on a trip throughout his native South Africa. Directed by Victor van Vloten and Robert van Wingerden. South Africa. 2015. 15min. US premiere. This inspiring documentary is about a 13-year-old boy from the township Dunoon in Capetown, South Africa. Paul has a dream, a dream he thinks about the whole day—he wants to become a surfer. Narrated by Robby Naish. Directed by Jason Hearn. Madagascar. 2015. 25 min. Slade Prestwich, Frank Solomon and Grant “Twiggy” Baker head to Madagascar where they chart new territory in their search for new waves to ride, and engage with villagers.